And... We are just 13 days away from one of my 2 favourite months of the year (The other being August, bien sûr!). I don't know about you, but I feel like time slips past us faster as we grow older. I distinctly remember sitting on the classroom floor in primary school, looking at the date on the chalkboard and slowly counting down to the year end. It took for-ever and it felt so painful. But now, it's like I'm trying to hold on to every single minute that I have. I want to fill my time with things that I have always wanted to do but didn't, because, well, life and procrastination. Heh. Oh yeah. And money too. It's sooooo good to have an income! Next year, I really want to take up makeup courses and one school that I have been looking at is Make Up For Ever Academy. I very nearly joined one last year, but the schedule wasn't too good for me. Also, it's really expensive. So while I save up for the course(s), let me take a look at things that are cheaper, i.e. 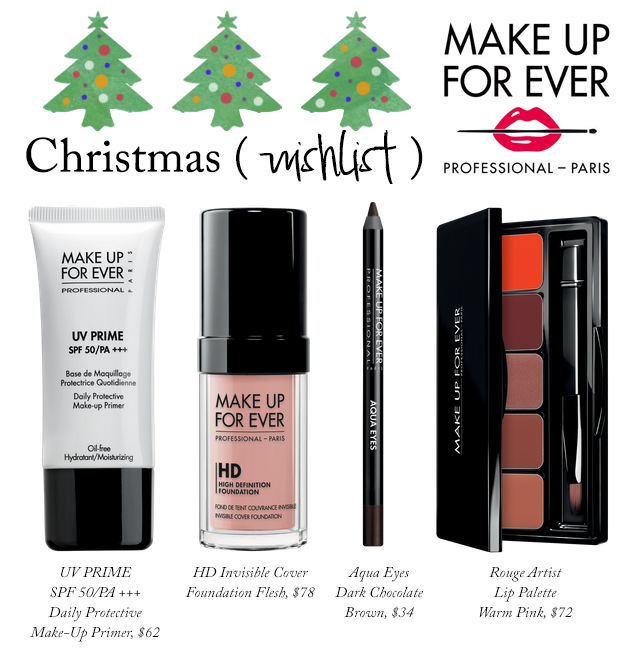 Make Up For Ever products. HAHA. What? I need to get acquainted with my future school!